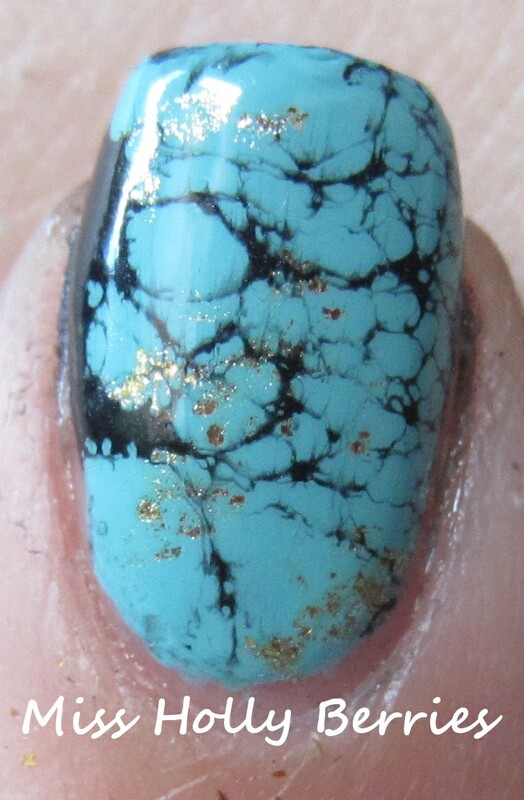 Earlier in the summer I saw a blog post on how to do these Turquoise Stone nails. Needless to say, I was absolutely hooked! I did this manicure with multiple different colors, as well as the traditional turquoise design. One of them was even a guest post that I did for Jennibertt! I really wish I could remember where I saw the original post so I can link it back, but I’m sure that many of you by now have already seen this design floating around the blogosphere. If you guys want a step-by-step pictorial tutorial let me know, but I think you can find much better tutorials from other bloggers. The basic technique is painting your nail a base color. Then dab on a metallic (or any color you wish) with the saran wrap/plastic wrap method. Make sure you dab off the excess polish on a paper towel prior to applying it to the nail. Finally, use the waterspotting method for the black (or any color) for the top marble. I absolutely love this look and plan on creating a few Halloween looks using this technique. What do you guys think? Have you ever seen this technique before? One of the most beautiful nail designs I’ve ever seen!!! this is absolutely stunning! I would love a more in-depth tutorial on this! i think i’m going to do one! i didn’t realize that many people didn’t know about this manicure so i’ll try to work on that this weekend. thanks for commenting! 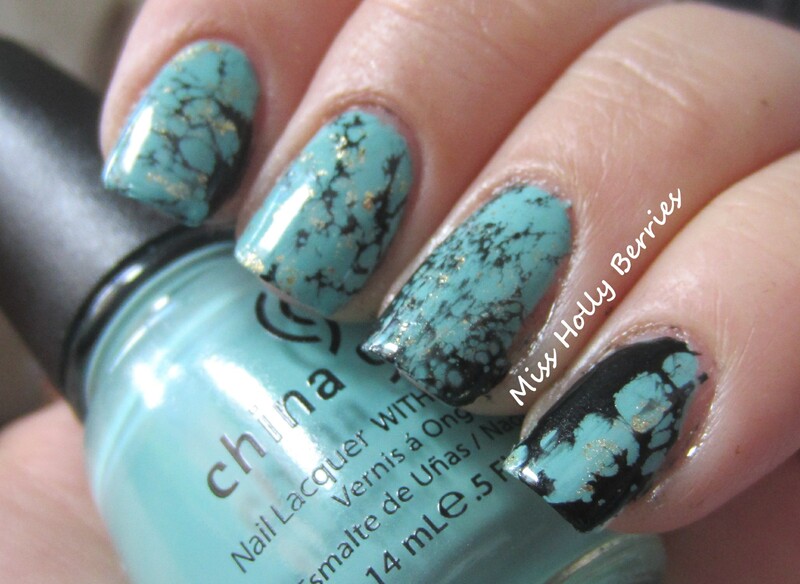 This mani is amazing! As if your nails turned into real gemstones. I haven’t seen anything like it before and I think this is one of the most beautiful manis I have ever seen. Just wow! I LOVE this and YES, I would appreciate it so much if you would do a step-by-step tut! I had never seen this technique until I saw your pic on Instagram when you posted it a while back. It sounds easy enough that maybe even *I* could try it – lol! thanks! and probably, he likes to bomb all of my nail photos lol thanks for commenting! Oh wow that’s so pretty and different its stunning.